If you are obsessed with gems and jewels, Jewel Strike is the slot game you must consider playing. It offers an amazing set up in the backdrop of a purplish red land that looks more like mining area. This 5 reel slot game has 10 fixed paylines and offers both ways winning combinations. It has two modes; one is the standard spins and the other one is epic spins mode where your bet amount is high but so are the chances of big wins. The betting limit is £0.20 minimum and a maximum of £25 per spin. The developer is Blueprint, an UK based gaming company with several years of experience in creating some of the world’s best casino slots. They offer graphically stunning games for online users and their games are played on several casino websites today. 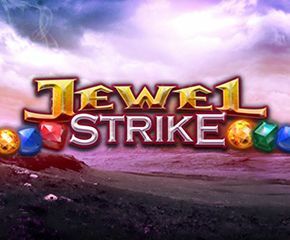 The symbols of Jewel Strike slots are red, blue and green gems along with a golden colossal ball which is the highest valued symbol. This symbol offers 500 times win on your bet amount when five symbols appear on a pay line. There are chances of the whole slot getting covered by this symbol and when that happens, you win will be 5000 times your bet amount. Which means you have an opportunity of winning £1,25,000. ● Colossal Reel Feature: This feature gets activated randomly during a spin and there is no defined rule to activate this. You have to be lucky for that to happen but if it does activate then three consecutive reels are covered by colossal ball symbol and this can guarantee you win on every line. This means you can win get those big wins that make huge money on your bet. ● Epic Spins: This is a bonus mode of Jewel Strike slots and you can eliminate some or all low-value symbols from the reel to increase your winning chances. If you want to remove three symbols, that is 10, J & Q then it costs 5 times your bet amount. If you shell 10 times your standard reel bet then you can remove all except the A from future spins. 20 times your bet amount will remove all low-value symbols keeping only the base gem symbols from which you can score big. If you want a simple game with the option of playing only with high-value symbols, Jewel Strike slots is the game you do not want to miss as the amount you can win is huge.